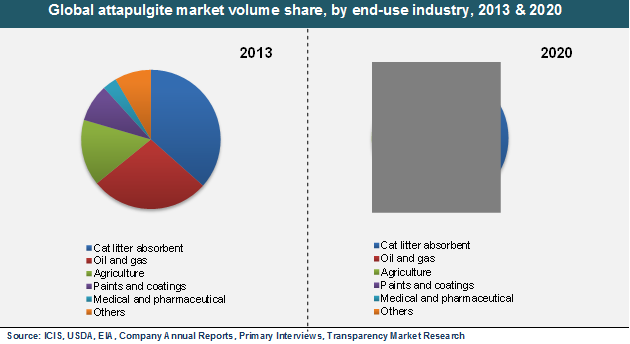 Transparency Market Research announces the release of a new research report titled “Attapulgite Market - Global Industry Analysis, Size, Share, Growth, Trends and Forecast 2014 - 2020”. The report indicates that the global attapulgite market stands to expand from US$238.5 mn in 2013 to US$418.8 mn by 2020, registering a strong CAGR of 8.30% in terms of revenue. Geographically, the global attapulgite market is divided into North America, Asia Pacific, Europe, and Rest of the World. In 2013, North America accounted for a 35.0% share of the overall attapulgite market, making it the leading regional segment. This market is driven by rising restrictions regarding the use of synthetic chemicals and abundant deposits of attapulgite-rich fuller’s earth. Asia Pacific, on the other hand, is anticipated to register the highest CAGR during the forecast period. This regional attapulgite market is fueled by rapid industrialization, growth of the healthcare sector, and rise in drilling and construction activities.